Bob Lutz and Gilbert Villarreal's venture "VL Automotive" that puts LS9s in Fisker Karmas was introduced as "America's newest, smallest, and most expensive automaker" in this afternoon's press conference. The proposition got vague from there. Lutz seemed indefatigably optimistic about the company, which is completely financed by "less than ten million dollars" of his and Villarreal's personal money, but there seem to be a lot of loose ends in their supply chain, roadworthiness testing, distribution network, and capacity to service the cars they sell. The new addition to their lineup, the Destino convertible, was identified by Lutz as a "pure concept with no production intent" and confirmed as a re-cladded Fisker Sunset. Lutz reminisced that a plan to consistently source the Karma components that make up 40% of the Destino was in place "until the restructuring" at Fisker, but didn't have much confirmed about what they'll do now that the company is dissolving. Could The Fisker Karma Be Our Generation&apos;s DeLorean? Nevertheless he's convinced there are enough people with Karmas who want VL conversions that the company will be able to survive off the current supply of Karmas for "four to five years." Conversions keep licensing simple; if you brought a Karma to VL for a swap their would be no need to re-register the car. But if VL plans to buy Karmas and build them on spec, they'll have to setup crash testing and everything else involved with being a bona-fide manufacturer. "We aren't totally sure we're compliant in the US," said Mr. Lutz. 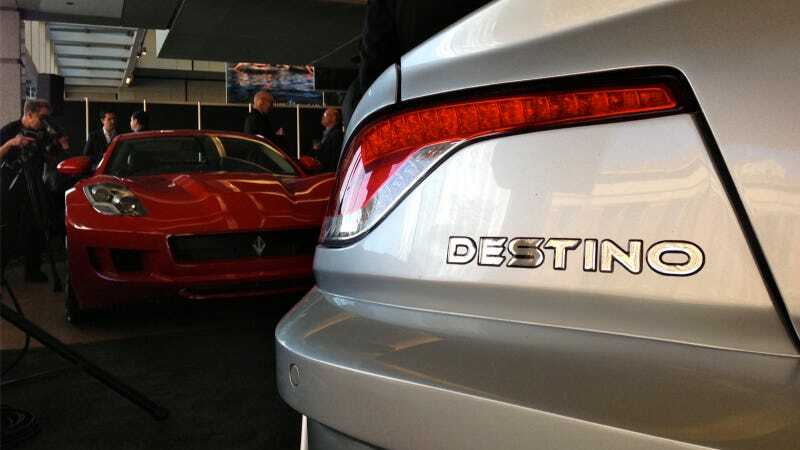 Bought from VL, a Destino is supposed to be about $200,000. As a conversion only, the cost is around half that. Lutz reported the company would have to sell "130 [cars or conversions] a year to make money." They're not bad looking cars and are purported to pull 195 MPH, but that sounds like an ambitious ask for a machine with unproven performance and no historic pedigree. VL Automotive does not have a completely established sales situation, but they did announce a partnership with a GM dealer network in the UAE called Liberty Motors. If and when crash-certification is completed in the US, VL hopes to sneak into other countries though limited-production provisions. Lutz affirmed the Karma was "hugely popular in Holland," and that he'd like to perform VL conversions there. A supercharged V8 might have significantly less appeal to the Dutch, who pay over $9 a gallon for gas, than an electric propulsion setup but I'm sure plenty of market research will be performed before parts are shipped across the Atlantic. Lutz was asked, "How will you support customers who have purchased these?" to which he responded "It's pretty much a Corvette, take it to a Chevrolet dealer!" Fair enough, but his advice for repairs outside the powertrain? "Take it to a Fisker dealer." That might not pan out too well. Now if he manages to rescue some of Fisker's tools as their company sinks into the sea, VL might have a better shot at keeping their cars alive. We're all dead keen to see how this one plays out. I wish Lutz and Villarreal the best of luck in their endeavor to make use of a pretty chassis, I think they're gonna need it.